The UAE took a giant leap in the medical field in 2017 with the successful completion of two deceased organ transplantation in the country, which helped save the lives of nine people. Videos of the first two deceased organ donation and transplantation procedures that took place in the UAE were released by the Mohammed Bin Rashid University of Medicine and Health Sciences (MBRU). The unveiling of the videos highlights the first steps taken in the launch of the national program for organ transplantation under the leadership of the Ministry of Health and Prevention with the participation of various national health authorities, government and private entities, with the collaboration of the Saudi Centre for Organ Transplantation. In 2016, the UAE government passed a law that allows organ transplants from deceased patients, which has already helped save dozens of lives. The videos highlight the first donation and transplant from a deceased donor in the UAE on July 15, 2017, where the deceased donated five organs, resulting in saving five lives. 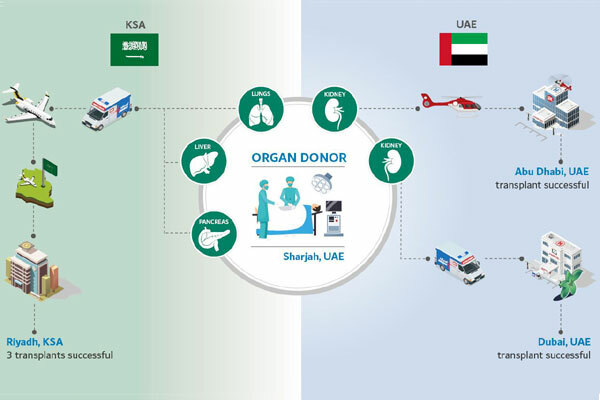 The second multi-organ donor donation and transplant was carried out in the UAE on September 23, 2017, where four successful transplantations were done that helped save four lives. Lives were saved due to the humanitarian spirit of the deceased’s family who chose to contribute to save the lives of others in a time of great distress, as well as the efforts of numerous parties, including but not limited to the Ministry of Health and Prevention, the Saudi Center for Organ Transplantation; Dubai Healthcare City Authority; Abu Dhabi Health Services Company; UAE’s Ministry of Interior; Dubai Airports; Fujairah International Airport; and others.